Welcome back! Happy Wellfie Wednesday! This week is brought to by Patrick (@TheFuelPhysio), our crew's RDN (Registered Dietitian Nutritionist). Today I’m here to celebrate RDN Day! As a part of National Nutrition Month®, the Academy of Nutrition and Dietetics celebrates RDN Day “on the second Wednesday in March, [a day that] increases awareness of registered dietitian nutritionists as the indispensable providers of food and nutrition services and recognizes RDNs for their commitment to helping people enjoy healthy lives.”(1) All of the information seen today has been collected from the Academy of Nutrition and Dietetics’ website (eatright.org). See the links below for additional information. Registered Dietitian Nutritionists have degrees in nutrition, dietetics, public health or a related field from well-respected, accredited colleges and universities, completed an internship and passed an examination. Registered Dietitian Nutritionists use their nutrition expertise to help individuals make personalized, positive lifestyle changes. Registered Dietitian Nutritionists work throughout the community in hospitals, schools, public health clinics, nursing homes, fitness centers, food management, food industry, universities, research and private practice. 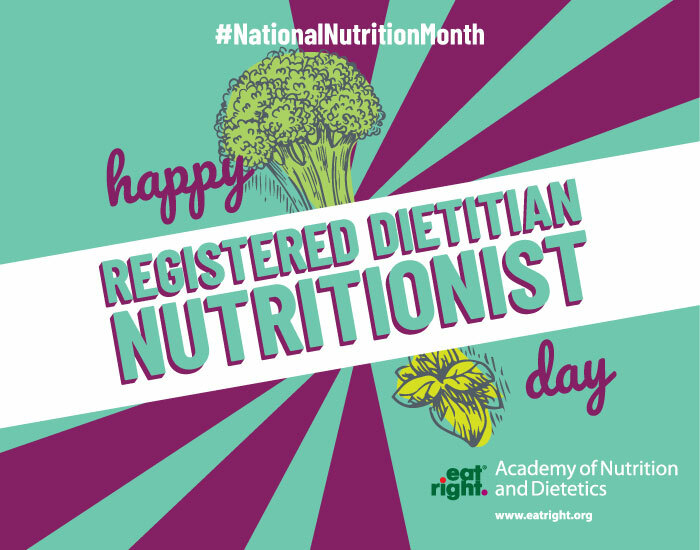 Registered Dietitian Nutritionists are advocates for advancing the nutritional status of Americans and people around the world. The highest level of nutrition counseling. Anyone can call themselves a nutritionist, but only a registered dietitian (RD) or registered dietitian nutritionist (RDN) has completed multiple layers of education and training established by the Accreditation Council for Education in Nutrition and Dietetics. In addition to holding a bachelor's degree, an RD or RDN must fulfill a specially designed, accredited nutrition curriculum, complete an extensive supervised program of practice at a health care facility, foodservice organization or community agency and pass a rigorous registration exam. What's more, roughly half of all RDs and RDNs hold graduate degrees and many have certifications in specialized fields, such as sports, pediatric, renal, oncology or gerontological nutrition. Personally tailored recommendations. When you see an RD or RDN, the last thing you'll get is one-size-fits-all diet advice. After learning about your health history, favorite foods, eating and exercise habits, an RD or RDN will help you set goals and prioritize. Follow-up visits will focus on maintenance and monitoring your progress. Help managing chronic diseases. If you have high cholesterol, high blood pressure, diabetes or cancer it can be hard to know what to eat. An RD or RDN can review your lab results with you, help you understand your condition, provide education about the nutrients that affect it and help you create an eating plan that includes all the important nutrients that can help you manage your condition. Guidance navigating food allergies, sensitivities and intolerances. When you suffer from conditions such as celiac disease, food allergies or lactose intolerance, it's easy to be overwhelmed by what you think you can't eat. That can translate into a boring diet and may even lead to nutrient deficiencies. An RD or RDN can teach you how to read food labels so you’ll know which ingredients to avoid and a help you find substitutions to keep your diet balanced and tasty. Practical lifestyle advice. Fad diets may sound like the quick ticket to weight loss, but they rarely work for very long. A registered dietitian or registered dietitian nutritionist will partner with you to develop a safe and realistic eating plan that you can stick with for the long haul. To guide and motivate you, an RD or RDN will use creative and out-of-the-box strategies to help with meal planning, grocery shopping and mindful eating. A bit more on National Nutrition Month®. We hope this week's tip was informative for you! Thanks again for all of the #WellfieWednesday support, be sure to post your pictures this week and tag the WW crew members in your post (@TheFuelPhysio, @Eric_in_AmERICa, @AaronPerezPT, @DianaKlatt, @kuhnalyssa_spt) and keep the wave of healthy change going!